In anticipation for the upcoming release of Bloodborne, I picked up a copy of Final Fantasy Type-0 HD, to fill the void for a week. It came with a playable demo, for Final Fantasy XV, a game I had absolutely no intention of buying. Having played the demo, this may have changed, and there may be hope that the series will survive. The demo introduces you to four main characters, who aren’t very memorable from just playing the tiny bit of story. They typically reminded me of Auron Lite, Diet Balthier, Tidus in young Clouds body, and a Zack Fair wannabe. Their voice actors are a little rough and will probably take a little getting used to. 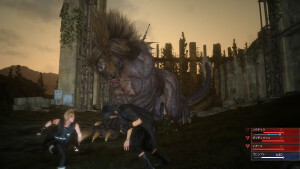 In the demo they are tasked with hunting a monster to earn money to repair their car. I personally have a funny feeling I will be referring to the game as Final Fantasy: Road trip. Anyway you set out into a beautifully rendered countryside wood, picking up the bounty quest from a signpost much like you would in an MMORPG, a little similar to the hunter quests in Final Fantasy XII. Monsters are free roaming, you can pull and agro mobs just by being near them. Combat is immediate and seamless, no shattering screens or loading, you are straight into the fray. The graphics really are amazing. A vivid and vibrant world awaits you, and one feature I loved was the progression from day to night. It seems the game is going to have time pass by, and it will effect the environment. I didn’t realise night was falling at first and when it did, extra monsters showed up to savage my party. I didn’t get to hear a lot of music in the demo, but I wouldn’t be too worried about that. In my opinion, the musical score is the one thing that has been consistently right in the Final Fantasy games. I took to the combat system very quickly, it’s kind of what has me nearly believing in the series again. It’s a mixed style of MMORPG combat and a Kingdom Hearts style of menu. Very fast paced, full of action, you are involved in these fights. You wont be setting up gambits or auto battling while you are off making a cup of tea. If you aren’t paying attention, you will see a game over screen. You are given a quick tutorial on the battles and shouldn’t have much confusion on how it works, although there is an interesting set up for weapons. Your main character will need to set five weapons to different slots to perform situational attacks and abilities, its new, I’m used to traditional styles of getting stronger weapons and equipping them, but this kind of works for me too. If your character is near death, he will struggle but can be revived by the AI team mates. This builds up a bit of tension and the old fear of ‘I’m not going to make it to the next town, save point, etc” is back. The summoning system is a little off. I guess it will make more sense when playing with a full story, but from the demo, I can see that your summon shows up when you are near death and have touched a relevant stone or source of the summon. The visuals in the demo for the summon are absolutely stunning. A screen sized god tearing your foes apart, exactly what a summon is supposed to be, no motorbikes with jiggly-parts this time. I noticed a few Easter eggs and throwbacks to the earlier titles in the series, kind of like the way FFIX had for older games. A fair bit of terminology from my favourite title was being used and I would like to see how that turns out. Hint, my favourite is not FFVII or FFVIII. Having played all major Final Fantasy titles growing up, I can say I was definitely a fan of the series. Final Fantasy 12 took the series in a new direction, that while a good game, to me, it didn’t feel like a Final Fantasy game. Final Fantasy XIII came along, I ordered the special edition, thinking the first Final Fantasy game on the new consoles meant a fresh look at the series. What I got was a dire, linear and boring game, with a one button combat system that played like a demo until the disappointing end, and two sequels that were supposed to fix this but didn’t. 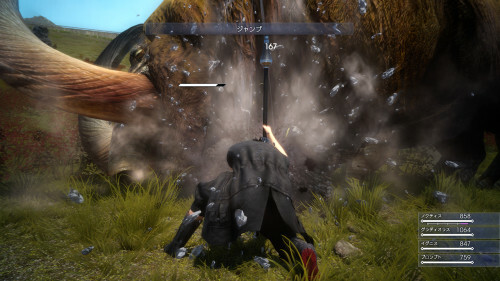 To me, this was Final Fantasy’s death. However, the demo of FFXV brings hope, if areas can be revisited and the story is engrossing, then counting the combat system and visuals in the demo, the series could be on to a much needed revival. It probably still wont feel like a Final Fantasy game to me, but I dare say it could be considered a very good reboot to the series. If you have your doubts about this title, I would definitely advise to keep an eye out for news over the next few weeks, my ‘no sale’ has quickly shifted to a maybe. Retro-Gamer. Favorite genre, RPG's, Survival Horror. Favorite series, Suikoden, Silent Hill. Resident Evil 6 Coming to Current Gen Consoles?